CHICAGO – What’s better than two blockbusters for the price of one? 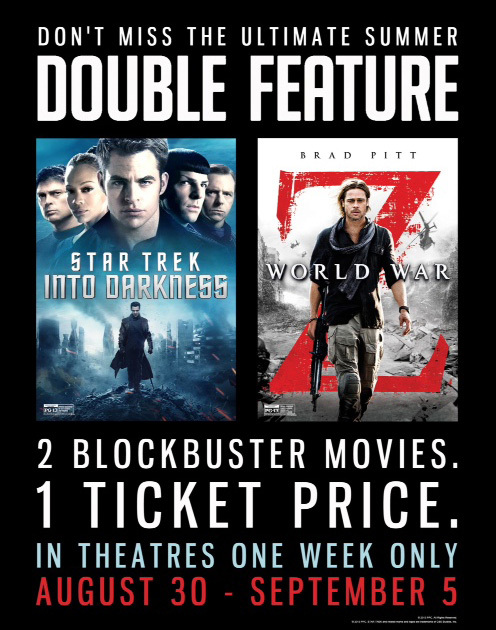 HollywoodChicago.com readers will score 20 pairs of guaranteed pick-your-showing double-feature tickets plus 10 prize packs to “Star Trek Into Darkness” and “World War Z” for free! Each prize pack contains a “Star Trek Into Darkness” T-shirt and hoodie and a “World War Z” hat and Subway Sam. The ultimate summer double feature, “Star Trek Into Darkness” and “World War Z” return to theatres for one week from Aug. 30 to Sept. 5, 2013. “Star Trek Into Darkness” stars Chris Pine, Zachary Quinto, Zoe Saldana, Benedict Cumberbatch, Simon Pegg, John Cho, Karl Urban, Anton Yelchin and Bruce Greenwood from director J.J. Abrams. “World War Z” stars Brad Pitt, Mireille Enos, Daniella Kertesz and James Badge Dale from director Marc Forster. To win your free double-feature tickets or prize pack courtesy of HollywoodChicago.com, get interactive with our unique Hookup technology directly below. That’s it! The more social actions you complete below, the higher yours odds of winning! Completing these social actions only increases your odds of winning; this doesn’t intensify your competition or lower your odds! You MUST enter your full mailing address in your submission. United Nations employee Gerry Lane (Brad Pitt) traverses the world in a race against time to stop the zombie pandemic that is toppling armies and governments and threatening to destroy humanity itself. “Star Trek Into Darkness” and “World War Z” return to theatres for one week from Aug. 30 to Sept. 5, 2013. This HollywoodChicago.com Hookup is simple! Just get interactive in our unique Hookup technology above. We will award 20 pairs of guaranteed pick-your-showing double-feature movie tickets plus 10 prize packs based on social entry numbers and/or randomly for our “Star Trek Into Darkness” and “World War Z” Hookup. Good luck! HollywoodChicago.com LLC is a promotional partner with the studio and its partners and doesn’t assume any liability for this giveaway. HollywoodChicago.com is not responsible for errors or omissions entered in user submissions. Comments are closed in this Hookup.